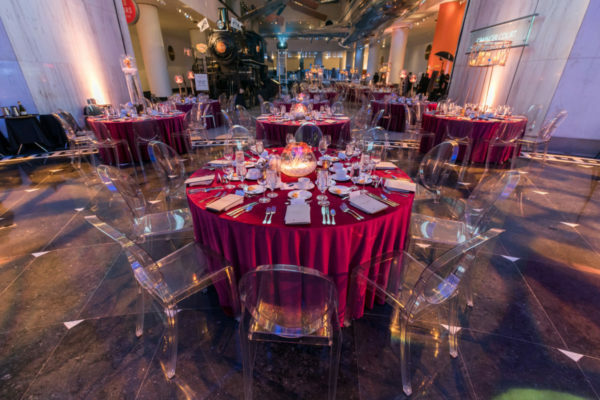 Home > Sodexo at the Museum of Science and Industry has won a Catersource ACE (Achievement in Catering & Events) Award for the second year in a row! On Monday February 19th, the Special Events team was honored to be chosen as the top venue in the Events, East Region, over 2 Million category. Winners for each award category were honored during Catersource 2018 Spark! Awards Gala, which took place February 19, 2018 at Caesars Palace in Las Vegas. This was the Special Events team’s second year in a row winning the honor. They submitted two events for consideration, the 2017 Black Creativity Gala and the Columbian Ball. Judging for the award was based on 5 qualifiers that are rated from 1-10. They include: Ability to meet challenges, caliber of events, creativity in the events, quality of the two events presented and then the overall quality of the company. The Special Events team edged out the Chicago Botanic Garden and the Detroit Athletic Club in their category. This nationally recognized award was possible because of the support from MSI staff members before, during and after special events. The Special Events team would like to thank everyone for their help—your contributions are a big part of the team’s success! The primary focus of Special Event’s “Art + Innovation” proposal for the 2017 Black Creativity Gala was the innovative cuisine being served to the guests of the gala. They featured on-trend fare with a wide range of culinary styles from food-truck favorites to Michelin-star inspired bites. 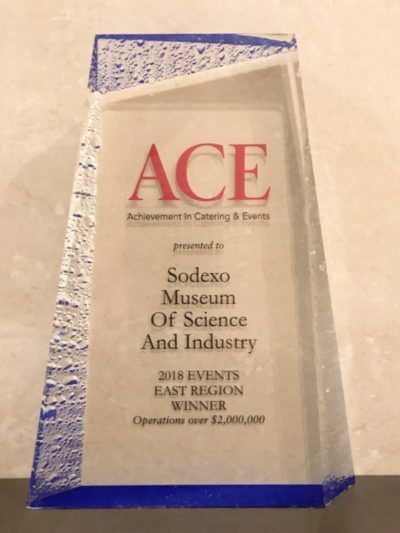 The perfect “formula” of food science and the Museum of Science and Industry and the art of Sodexo’s cuisine was featured at our N2vation station. This dessert station featured liquid nitrogen that was poured out of a tank in to a stand-mixer filled with various ice cream bases. This technique rapidly freezes the ice cream, almost instantaneously, creating a spectacle right in front of our guests’ eyes. The classic Buttermilk Vanilla Ice Cream was complemented by unique, yet thematic flavors such as Bourbon Pecan Pie and Apple-Butter Sorbet. This dessert station combined the best of art and innovation and made the 2017 Black Creativity Gala one that guests will be talking about for years to come. 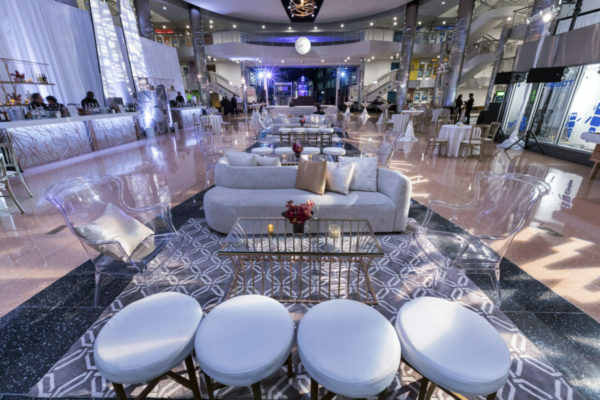 The 2017 Columbian Ball’s theme and décor inspiration was a contrast to the prior year’s historic presence. This year’s Columbian Ball was framed as a contemporary, modern benefit with gilded touches that reflect the Columbian era. The objective for the 2017 menu development was to challenge the long-established menu tradition of Southern flair. We had to challenge that notion and veer from the status quo to not only impress the event committee but surge past the other proposers in the competitive bid process. 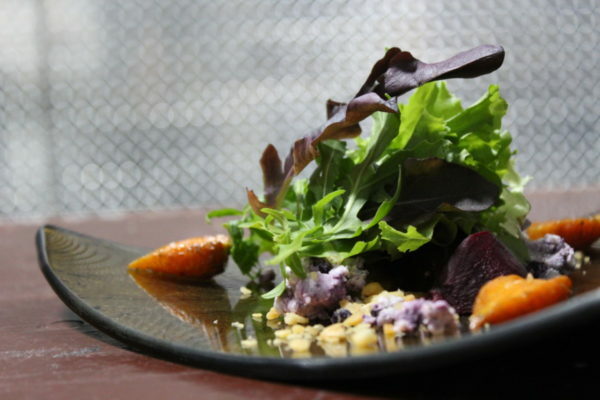 Executive Chef Brad Bussen’s vision for this event was avant-garde cuisine, stylistically designed while still honoring the traditional items favored by the audience in year’s past. The Columbian Ball’s plated entrée was aggressive yet delicate, innovative and traditional – a logistical challenge to achieve for 800 guests. The dual entrée tower of 14-hour Applewood-smoked short rib with sustainably caught red snapper glistened under the lights of the 120-foot copper-domed Rotunda . As guests explored the dish, they found, supporting the two contrasting main proteins, a bed of creamy taleggio polenta. The salty-smoky base complimented the duet and provided a home for the surrounding Louisiana bouillabaisse. The entrée was prefaced with an earthy amuse bouche of saffron lobster bisque and crème fraiche.